This post has covered Ajax Crud application in Laravel with Datatables and here we have discuss how to remove or delete data from Mysql database table by using Laravel and display remaining data in Datatables without refresh of web page. Here we have convert one part of CRUD operation by using Ajax in Laravel Framework. We all know Laravel is a robust PHP framework and if we have use Ajax in this framework then it has provide stylish web using experience, because by using ajax we can do any operation without refresh of web page. 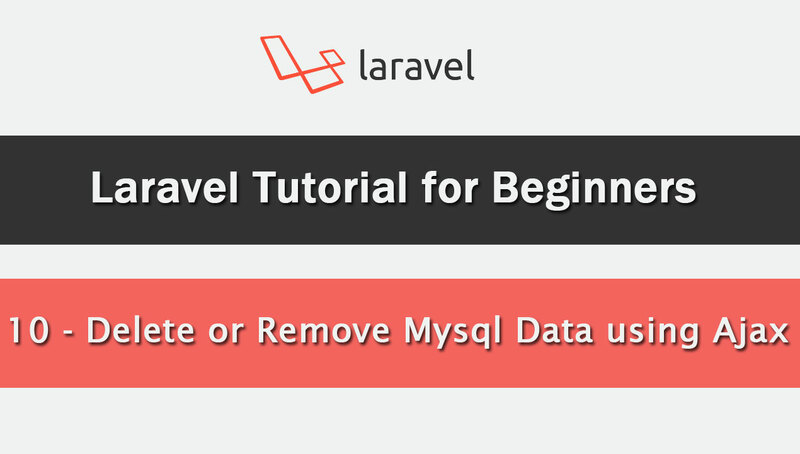 So, In this post we have learn how to delete or remove single record from Mysql Database by using Ajax in Laravel framework. First we have to make indiviual delete button for all data, so for this we have to go to app/Http/Controllers/AjaxdataController.php. And in this file we have to first put code for make dynmic delete button for all records. After making of dynamic delete button, now we have to write jquery code in resources/views/student/ajaxdata.blade.php view file for send Ajax request for remove particular data from mysql database table. After this we have create removedata() method in app/Http/Controllers/AjaxdataController.php this file for delete particular data from table. This method will received id from Ajax request and based on value of that id it will remove data from Mysql database without refresh of web page. Lastly we want to set route for this removedata() method in routes/web.php file. Because it has make url and in Laravel we have to set route of each url which we have made for any operation. So, we have to write following code for make route for removedata() method of controller. So, this is whole code for delete or remove data from mysql table by using Ajax in Laravel. If you have any doubt then you can also view video tutorial of this post also at "Webslesson" youtube channel also.